Own an artifact from the English Reformation! Preserved within this book is a leaf from the first edition of the Actes and Monuments commonly known as Foxe’s Book of Martyrs. This leaf is an authenticated original page, over 450 years old, from arguably the most influential book in the English language other than the Bible. First published in 1563, John Foxe’s magnum opus had an incalculable influence on the development of English national identity and on the spiritual impetus behind Puritanism and the later Methodist Revival. It became an immediate cultural phenomenon, with devotees ranging from children who marveled at the story told by its incredible woodcut illustrations to Sir Francis Drake who perused its pages during long voyages. Its literary impact can be traced through the writings of such luminaries as John Milton and John Bunyan. In fact, when Bunyan could have only two books while imprisoned in Bedford jail, he chose the Bible and Foxe’s Actes and Monuments. In the following century, when John Wesley published his Christian Library of spiritual classics, a prominent place was given to his own abridgement of Foxe’s great book. Now you can own an actual page from the exceedingly rare first edition of this classic that helped ensure the Protestant heritage among English-speaking peoples and beyond. Enshrined in a lustrous book (84 pages, Aldersgate Heritage Press) bound in full calf leather and befittingly ornamented with intricate gold accents, accompanied by a historical essay by Wallace Thornton, Jr.-“John Foxe and His Monument: A Theological-Historical Perspective”-and interspersed with a dozen exacting duplicates of the original’s breathtaking woodcuts, this leaf provides a tangible reminder of the extravagant sacrifices made whereby we enjoy the religious freedoms that we exercise today. Prices vary for premium leafs including those with woodcuts but start with a leaf of the publisher’s choice at $495.00. 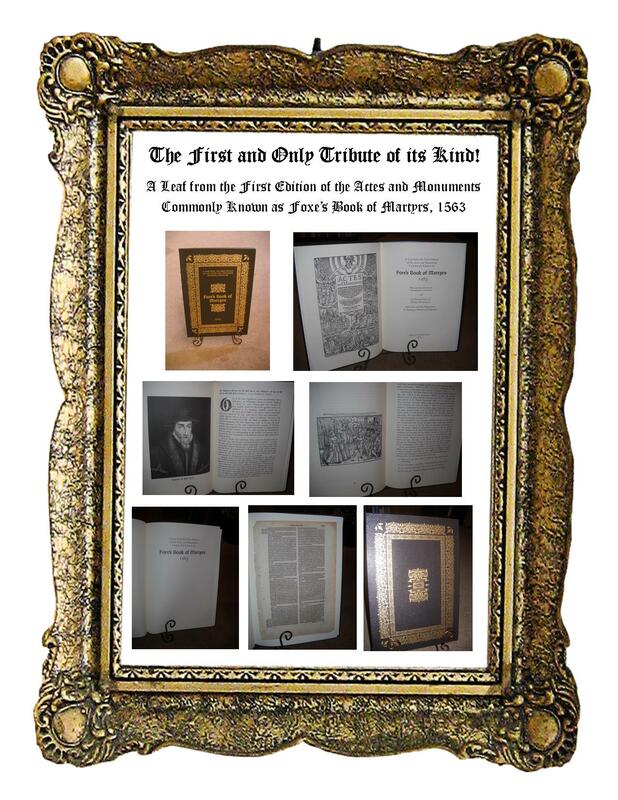 This is a limited edition collectible with each page being a one-of-a-kind, priceless artifact. Make one part of your library today! For more information, contact a representative HERE. Read the review by Michael Stillman in Rare Book Monthly (March 2015). Copyright © 2015 by Wallace Thornton, Jr. All Rights Reserved.